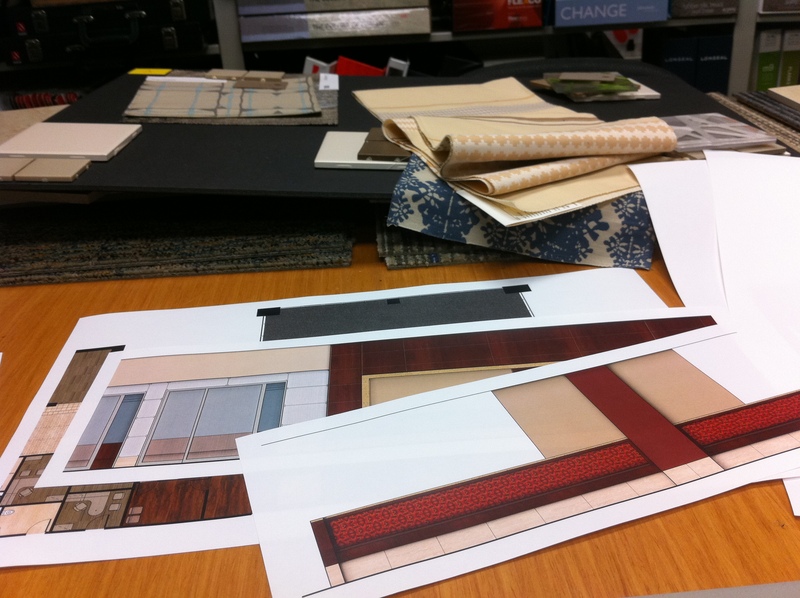 Cutting out my Photoshop renderings and putting together boards for a presentation on Monday. I consider this some of the “fun” stuff. I always enjoyed coloring, so this is really just coloring electronically! I learned how to do Photoshop in college; our professors brought in a graphic designer to teach us and we were skeptical (“I thought we were learning AutoCAD?”). At first we just learned how to fix the red-eyes in photos, but we eventually learned how to render up elevations and floor plans. 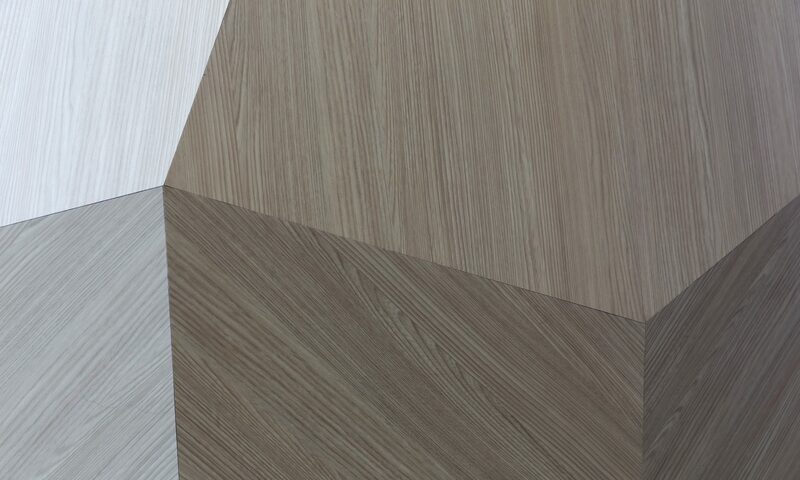 Clients really seem to understand the ideas better when we can show them something as plain as this–“Here’s a cartoon of what the space will look like.” It’s easy to take the .jpg from the manufacturer’s website, who will have the best images anyway, of their fabric, flooring, woods, etc. Even Sherwin Williams and Benjamin Moore will give you the RGB numbers to get the colors right. I think my rendering style is a little heavy with the shadows and can look a little cartoon-y at times. At least I have a “style,” right? 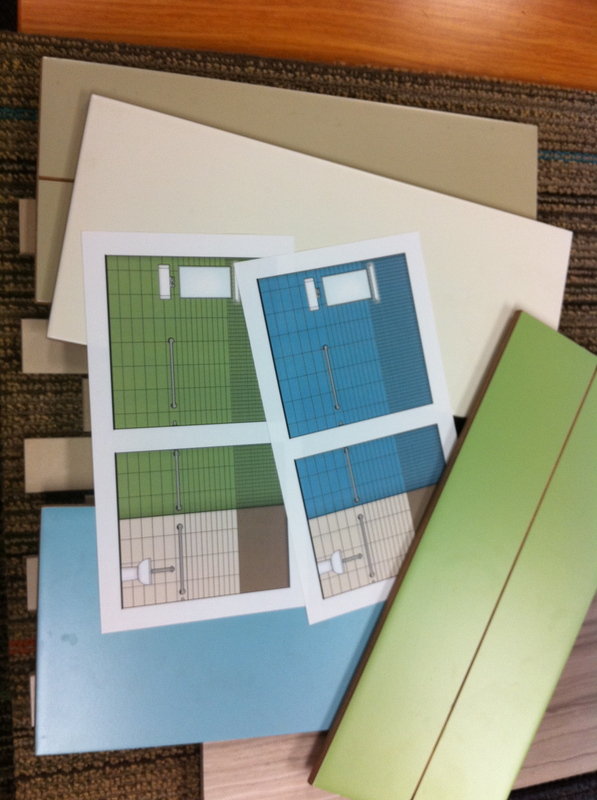 Some tile options for the restrooms using Concept Surface’s Vivid Series. I’ve been obsessed with this line for a while now, so I hope I get to use it. There are so many good colors. 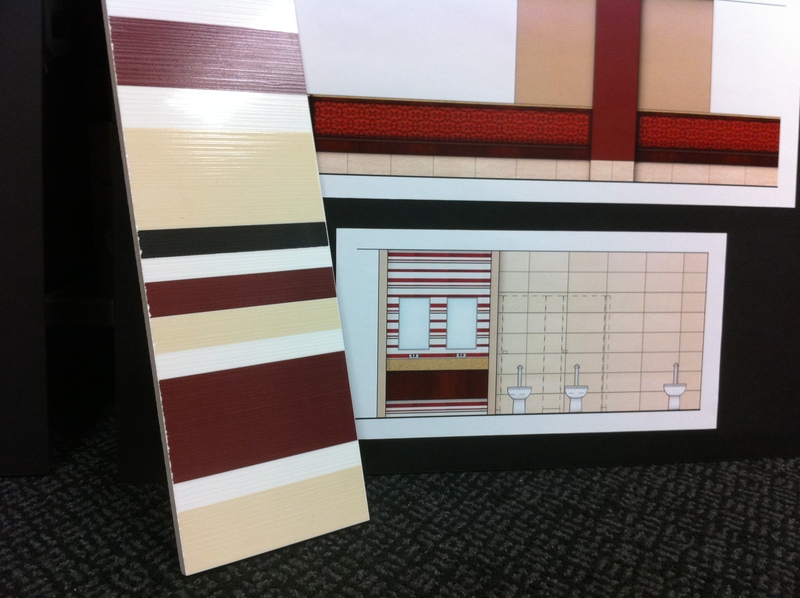 The actual tile sample (Concept Surface’s Visionary Series) next to the public restroom rendering. I think it’s just the right amount of excitement or “umph” in there–but really, I think it would look great if the whole wall was striped! 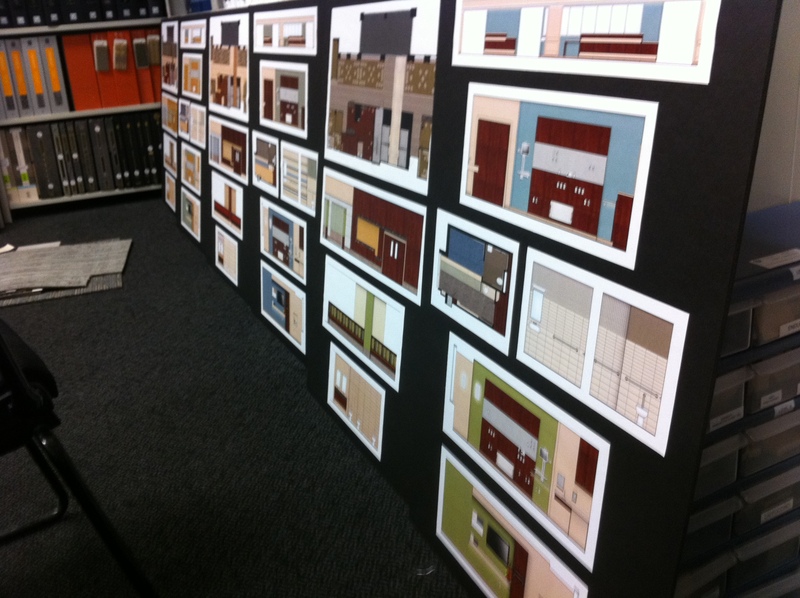 We’re showing four different schemes which means many renderings, which leads to many boards! I don’t care which one they pick because I’ve grown fond of them all–it makes it easier to sell them too! Wish me luck! 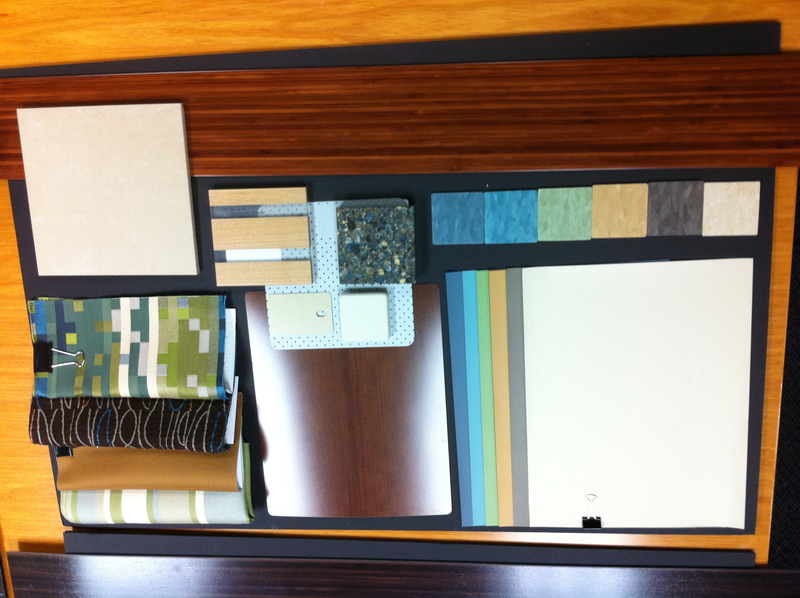 UPDATE: The green scheme/my favorite scheme was selected! Although it became a hybrid of the “green scheme” and the “red scheme” minus the red. I’m very happy with the results, now we’ve just got to get it documented and constructed! Good luck on your presentation – it looks great!